I'm so glad you could stop by for the JustRite Design Team Blog Hop! I'm thrilled to be showing you some of the things you can do with the new Witch Way to the Treats Set from JustRite. 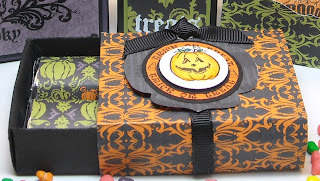 This cute set has 10 Borders and Centers perfect for adding to your Halloween packages. These images fit the JustRite 1-3/16" Wood Stamper. This JustRite set will be released on July 22nd, this is a LIMITED EDITION set, once it's gone, it's gone forever! 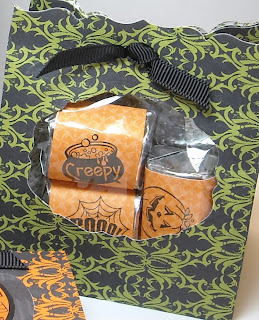 For my projects, I used the JustRite Witch Way to the Treats to create some adorable treat holders. The small test tube holder box was created using the Box #2 Die Cut from Stampin' Up! I used the 3/4" Circle Punch to punch even spaced holes in the lid, added an Eggplant Trim (3/4" Circle cut out of a 1" Circle). I applied the Spooky Treats Rub on to the Cast-a-Spell DSP and added Faux Brads with the Double Circle Punch. 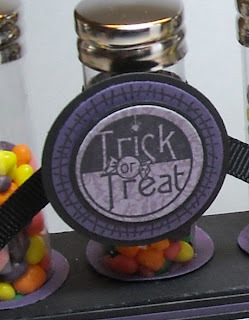 For my tag, I stamped the Trick or Treat Centers image from the JustRite Witch Way to the Treats on a piece of Cast-a-Spell DSP, cut with Spellbinders Circle Dies. The Border image is stamped on a piece of Eggplant card stock. I tied a Black Grosgrain around the Pug-Tastic Tube and adhered my tag using a dimensional. This box is the Matchbox Die from Stampin' Up! I used the die to cut Black card stock and the Cast-a-Spell DSP for the wrap around the box. For the nuggets, I cut 1" x 3" pieces of DSP and wrapped them snuggly around the nuggets. To create the tag, I used the Pumpkin Center from Witch Way to the Treats, stamping in Black Archival on Watercolor paper, and coloring using the Marker Watercoloring Technique. These layers were cut with a combination of Spellbinders Dies and Stampin' Up! punches. The pumpkin center was attached to the tag with a dimensional. The Large Test Tube is from Martha Stewart, I picked these up last fall at Michael's. I used my Single Test Tube Holder Pattern to create the box from Black card stock. I cut the Cast-a-Spell DSP for my panels, and added the Treats from the Spooky Treats Rub on across the bottom. For the tag, I stamped the Skull Center from Witch Way to the Treats in Black Archival on Watercolor paper, colored using the Marker Watercoloring Technique and cut with Spellbinders Circle Dies. The other layers were cut with 1", 1-1/4" and 1-3/8" Circle Punches from Stampin' Up!. On the Olive layer I stamped the border in Black. After tying the Black Grosgrain, I adhered my tag using dimensionals. This small bag is the new Fancy Favor Die from Stampin' Up!, cut from the Cast-a-Spell DSP. After cutting the die, I cut the center away using the Big Shot and the Lots of Tags Sizzlits from Stampin' Up! I cut 1" x 3" pieces of Cast-a-Spell DSP and stamped some of the Witch Way to the Treats images in Black Archival, wrapped them around the nuggets, and placed them into a Small Cello Bag. I used the Double Circle Punch, to punch holes in the bag and tied the Black Grosgrain using a No Tie Bow. To order any of the Stampin' Up! products used, shop my website 24/7. Lisa, You have yet inspired me again on your projects translated into Halloween! Love all of it - darn - those test tube conatiners. I refuse to pay 60 cents a piece for them and - just doesn't seem right at all. I haven't been able to find them at Michael's at all. But they sure look great. I can just see them in Christmas colors, too. Thank you for sharing these projects. All your projects are fabulous. Love Halloween, it's a fun time for crafting. You must have had a blast with so many little goodies! Ohhhh...Lisa! These are fabulous! 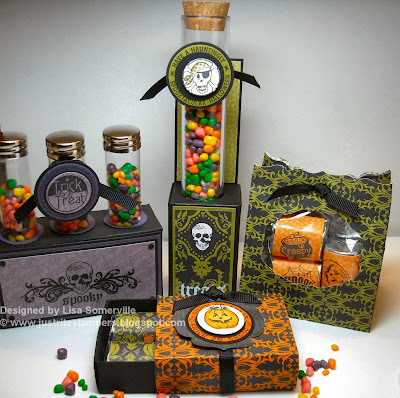 Love ALL the packaging ideas, just wonderfully spooktacular! Take good care! Oh my Lisa! These are just amazing! WOW!! So fun!!! Awesome projects! I love this new JRS set and can't wait to get it. How colorful! These give me inspiration to get ahead and start some projects. Thanks! 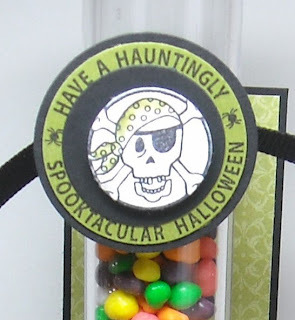 I love these Halloween treats! I love the box for the test tubes too! So clever! These look totally amazing!!!! We don't celebrate Halloween in Australia, but these make me wish we did!!! Love all the details you done to make such stunning projects!!! WOW--this is an Amazing Halloween Ensemble!!! I Love all of it!! I love all the fun DP you used to! Fantastic!! oh Lisa - you have done it again - wonderful job! These projects are awesome! I may have to purchase those stamps. nicely done!